Come, those in dangers and temptations, let us take refuge in the wondrous help of Markella, crying out: O Champion, deliver those who hasten to your protection in faith, for you stand with boldness before Christ through the crimson and martyrical radiance of your garment, O Virgin Martyr. Apolytikion in the First Tone. Submitting to the laws of the Lord's divine teachings, you strove to keep them blamelessly, O Martyr Markella. And fearing the violence of your father, you fled from him and dwelt in the mountains. Pursuing you he found you and slew you, O undefiled bride of Christ. Glory to Him who strengthened you. Glory to Him who crowned you. Glory to Him who works healings for all through you. Then Psalm 50, followed by the Canon in the Plagal of the Fourth Tone. O Saint of God, intercede for us! Entreat the Savior and God of all ceaselessly, O Markella, and deliver from trials we who approach you with reverence, and shelter all under your protection, O all-glorious martyr of the Lord. I am full of persistence, as I behold my life that passes by and mortality. Raise up my nous to behold the things on high, for you dwell upon the Holy mountain. Heal the many passions of all, granting health to the body and the soul, to those who cry to you in fervor, O Markella, the comely martyr by your presence. Hail, the only hope of all. Deliver all those who in unflinching faith take refuge in the hope of your compassion, O Virgin Theotokos. Save, O martyr of the Lord, those who hymn you in truth and fervor, O all-chaste Markella, that being saved through your intercessions from the wiles of the evil one, we might glorify Christ. Being fully illumined through noetic light, and beholding theoria, O victorious Markella, you reclined your head to your brutal father, and proceeded with joy towards heaven. You were truly shown to be a divine haven on the Island of Chios by Christ the Lord. Therefore, we take refuge in your Church, O Markella, receiving endless peace therein. Most-holy Virgin Theotokos, O unwedded one: visit my soul that is totally sick, O pure one, and purify it, granting tears of repentance, and thereby becoming glad through them. 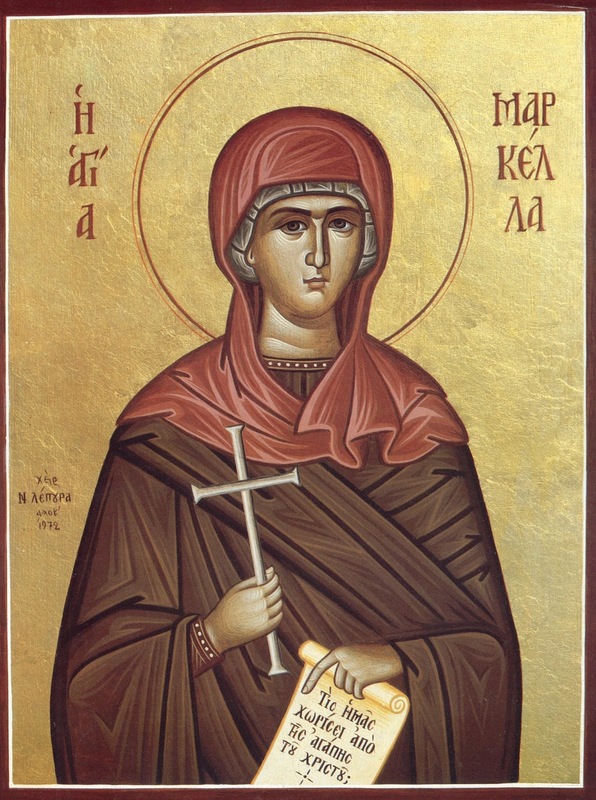 Deliver from every kind of temptation, O Champion, those who hasten to your boldness in faith, and who call upon you, O victorious martyr Markella. And the Priest says the ektenis. The rock that received you, O chaste Markella, has become a wondrous spring of healings, healing all those who with faith partake of, or are sealed with, the water that springs forth, to the glory of Christ your Bridegroom. Those on earth cry to you, O Markella: deliver from the evil dragon, and keep those you hymn you unharmed. You became a beautiful bride of the Lord, O all-precious Markella, arrayed with the stole of your blood, and holding the lamp of Virginity. Those who hasten to your holy Church from all places, awake from the sleep of ignorance to the working of the commandments of your Master. Grant me deliverance, All-spotless One, in soul and body, and make the skipping of evil to disappear, and dissipate the cloud. Your head, having been thrown into the sea, sanctifies the waters, for you were beheaded by your father's hand, on behalf of your Creator. Deliver us now, O Markella glorified by God, that we might ever proclaim your wonders, having been delivered from every tribulation. Having loved Christ, the Savior of the whole world, you hearkened to His calling to the next life, and took up the Cross of martyrdom, O Virgin Martyr Markella. Having struggled, O Pure Mother of God and Bride of God, I call to you and say with fervor: O Theotokos, in my time of need, help me with your help. You were pierced by the arrows fired at you by the enemy, O martyr, through the bow of your father's hand, therefore I entreat you, O godly-minded Markella, heal my wounds, and in the end, with your hand make the sicknesses of soul disappear. The adornment and boast of Chios, and a divine sanctification, you were shown to be through your many unconquerable intercessions, and as a true refuge and firm protection from him who works scandals among us. Your temple has appeared as a free hospital for the illnesses all, and dangers and multitudes of evils, for therein we receive deliverance, O champion bride of Christ the Lord, for those who hasten there with faith. I am amidst many temptations, O unwedded Mother Theotokos, save me, O Lady, in your sympathy, through the intercessions of Markella, for she has been made the true boast of Chios, and a divine treasure of Grace. The priest says the ektenis. The reliquary of your sacred rock has now become a hospital for illnesses, and a surrounding wall for those in storms, O Markella, but ever keep unharmed those who hasten to it and partake of the water, protecting them from dangers, and the wiles of the evil, as you look down from heaven on them with sympathy, O victorious martyr. Verse: The Saints that are on the earth, the Lord has shown wondrous. God is wondrous among His Saints. Through the intercessions of the Champion, O Merciful One, blot out the multitude of my offenses. O comely virgin and bride of the Bridal Chamber of glory above, O victorious Markella, being first pierced by the arrow, for your Creator, you then noetically beheld your Bridegroom within you, sanctifying the wound, O Chaste one, making your blood that ran from the wound to sparkle like the waters of the sea, and you left this life by the sword of your father. Not being unable to flee, the rock covered you, and your head was severed. O Markella, deliver from all pains, and dangers of the enemy, and every trial, and the corruption of the demons, and the hate of men, those who ever hasten the rock that was rent. O victorious martyr, deliver those who hasten to your water from various afflictions, and terrors and dangers, and preserve all those who honor you in faith, in every evil hour. Your reliquary has become a harbinger of divine sanctification, and a spring of healings, O Markella, in which the island of Chios ever takes refuge, O much-suffering Martyr, where is the rock that covers your sacred body. You are honored more than all the Seraphim and Cherubim and the powers above, the martyrs and the righteous, and all the Saints, the Prophets, the Apostles, the Hierarchs, and the Patriarchs, O Mother of Christ God. Protect from heaven ceaselessly, in ever hour, those who hasten to your holy Church, where you struggled and the rock was rent. Being enriched with your intercessions from heaven, O martyr, and the healings that you grant through your water, heal me at the end, I cry to you. Heal my all-wretched soul, O Bride of the Lord, along with the body, making it a temple of Christ God, your Bridegroom. Drive away all evils and difficulties and corrupting trials, O Virgin, by the power of your divine intercessions. Deliver, O martyr, from all dangers, enemies invisible and bodily, and from every evil, those who take refuge in you. Kneel before the throne of the Trinity, and deliver me from all evils, as you were granted boldness, O Markella, at the Divine throne. Angels above praise and join chorus, and join with the rejoicing of those here. Look down from heaven, O Markella, on those who honor you. Makarios of Corinth, with Nikodemos, came before the rock which covered you, and later the divine Nektarios came. Through the All-pure Theotokos, cover us, O Markella.